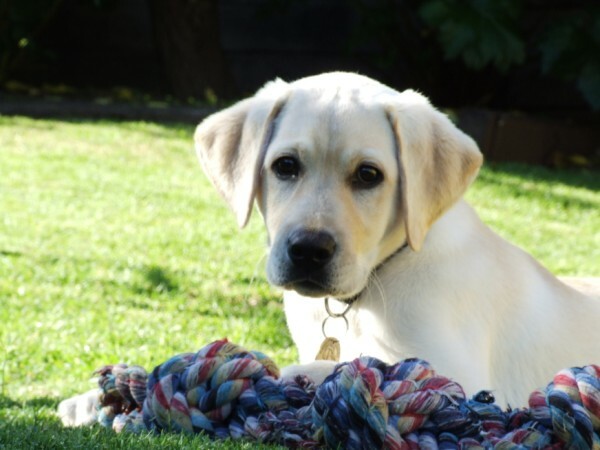 First of all I have to share this beautiful photo I took of the new baby in the backgarden the other week. This is Qaylie at 12 weeks of age and she is just gorgeous. I'm sure there will be plenty of other pics to share too. This weekend I ran a masculine card class and the ladies completed three cards. This uses some old TLC papers, Kaisercraft Script stamp and a greeting from the Sugarloaf 248 stamp set, some Kaisercraft pearls and a die-cut created in Design studio from the Storybook and George cartridges. 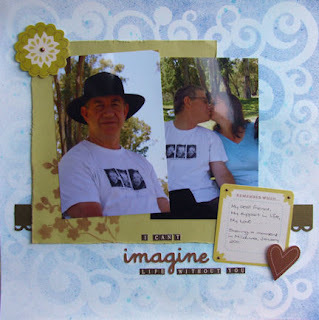 Love this Bird Call Cuttlebug embossing folder and it always looks good for a masculine card. Stamp is from The Stamps of Life banners4all set. 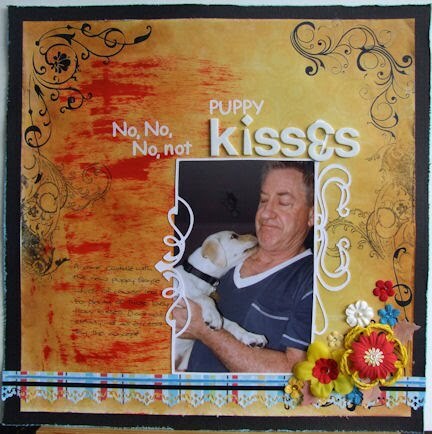 This one for a younger male is made with more stamps from the Sugarloaf 248 stamp set. Last weekend I was involved with Cybercrops at both Scrap of Difference and Home and Scrapped. 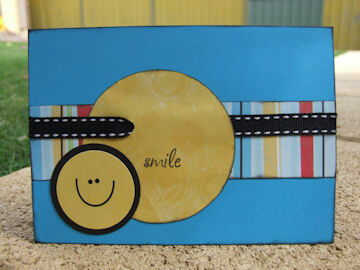 Scrap of Difference had the theme of Smiles, Frowns and funny faces, so the card challenge had to include scraps from one of our layouts and a face....... Trying to use up my old TLC papers all the time so this was fun. 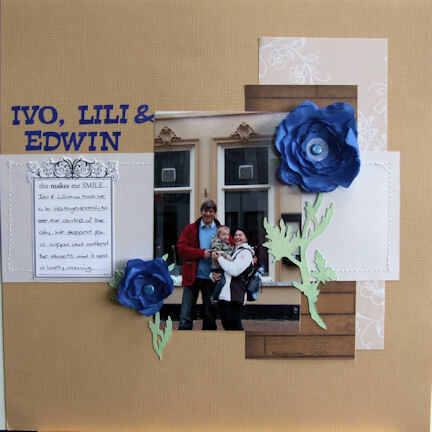 The papers for the card came from this layout. This was the sketch challenge and I altered the plain yellow paper with paint, rub-ons and stamps. The frame was created in SCAL using a couple of cuts that I purchased from the SVG blog. The border punch is Fiskars lace which I love to use even on male pages. This layout was a combination of two challenges. The technique challenge at Scrap of Difference required using masks or stencils on your background. I used the Cosmic Swirls Crafters Workshop template with glimmermist and the Cherry blossom template with chalks. The Home and Scrapped part of the layout was to create a layout using the title "I can't imagine life without you." Back to some travel photos from my time in the Netherlands for Heather's sketch challenge which had to include some stitching and handmade flowers. Just one of the lovely families I stayed with during my trip. 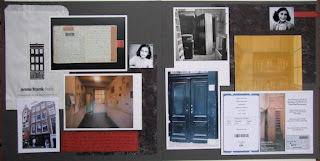 Sarah at Home and Scrapped, asked us to create a layout using ephemera. I had some wonderful bits and pieces from my visit to Anne Franks house in Amsterdam. You are not permitted to take photos inside the house so I purchased a few postcards of the things I saw and included a couple of pics of the outside of the house that I took. There is also the online ticket that I purchased before I left Australia (thank heavens! - didn't need to line up) and the guide book that you receive upon entry. Sarah also gave us an advertisement to use as inspiration for our layout. 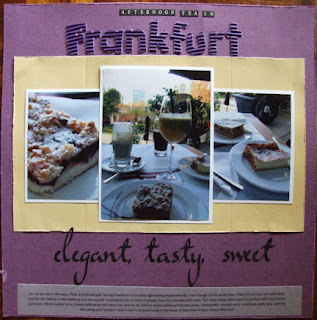 It was a Donna Hay recipe book ad and so I kept the food theme and the layout design for my afternoon tea photos in Frankfurt. Just had to eat a streusal cake in Germany. Yum! I hope some of you are still planning to get a layout in for the Monochromatic challenge over at Scrappassion.... just a few days in the month left now to have a play. Last Christmas season I bought the Kaisercraft North Pole 6.5" x 6.5" paper pad as I really loved the colours of the papers. Of course I really didn't get a chance to use them much because I had already made my cards earlier in the year so have been putting them to use in recent weeks for my cards for this Christmas Season. Inspired by Pinterest above. Above is another Paper Wishes sketch for World Card Making Day and below is OWH sketch #236. 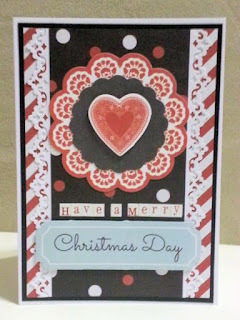 Another Pinterest inspired card using a lace stamp from Kaisercraft - Oh so lovely set. And last but not least another sketch that I can't find the details for. Kerry at Crafty Cards and Cuts had a night time video class on Periscope one night to make cards with scraps so thought I would play along. I didn't get very far with my efforts but at least got a couple made. 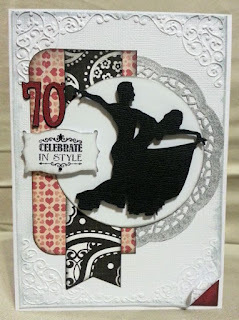 Another birthday for a male dance friend so hoped that this would look more masculine with the design. He was very pleased with the result and surprised that someone would go to the effort of personalising a card for him.